The unknown intrigues. The flâneurs, while playing with them, adjust to differents grounds succeed one another under their feet. Their wake dressing up in traveling memories. As far as the eyes can see, adventure is waiting, hiding away, not far. Insolents, explorers are sliding. The escape begins. Tawny desert dunes to sandy moors, bristled with palm groves, their outlines melting into setting suns. From snowy landscapes to tropical canopy shadows, they stay on course, juggling between pastel hues and invigorating colors. Thrilled, open to all tomorrow’s horizons. Now, summer premises are coming. This is time to decrypt travel books or long itineraries... and to wander towards scum and to play with mountains roads. Speed, chase illusions of dunes or choose to slalom across cactus. Four univers, four brands, four such as the four cardinal points, and one goal: guide you, in roller skates, to enjoy and discover numerous atypical horizons. New collection is there! 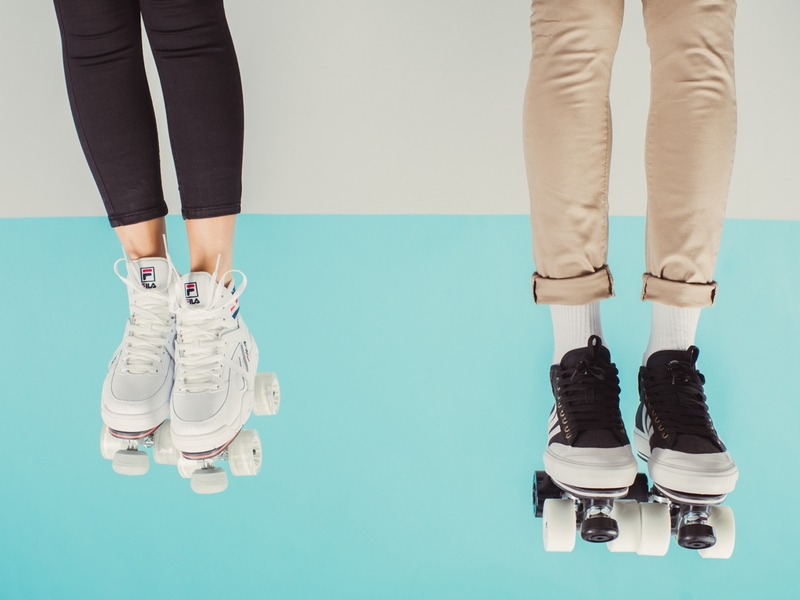 Discover our four travelling universes and leave with a detachable roller skate pair. All new models are available with Iconic and Premium rolling parts. Differences between the two ranges are detailed here. Those model are also available for a Change Your Shoes. Vans was founded in 1966 by Paul Van Doren, James Van Doren and three other partners, all passionate about extreme sports. Designed by and for the skateboarding community since the end of the 1960s, Vans quickly become an icon of the streets and created a craze for the “on wheels” community (skate, roller skate, BMX). The legendary Vans Sk8-Hi, created in 1978, is inspired by the classic Old Skool. It is known and recognized for its iconic side stripe, which is the hallmark of the Sk8-Hi model. This pair features a resistant canvas and one suede upper, padded ankle and vulcanized waffle sole. The Vans Sk8-Hi Delft flows across the vintage style in a modernized aesthetic. The V-10 model was created to celebrate the 10th anniversary of Veja. The brand offers the appealing idea of no longer having to choose between design and commitment, and offers a pair of sneakers that go through the ages. The choice of colors and finishing touches is the result of work in common between Veja and Flaneurz design offices. Light and all surfaces, those clip on skates are ideal for urban mobility, leisure and exploration. The V-10 model is available in Extra White Swedish Blue. The three-band mark was founded in 1924 by the two Dassler brothers. First named "Dassler", the company takes the name Adidas (contraction of the name of the co-founder Adolf "Adi" Dassler) when the two brothers stop working together. Concentrated on the performance needs of sports shoes, it was during the Berlin Olympics in 1936 that Adidas became world famous. Inspired by vintage tennis shoes, the Matchcourt Mid model has specific details from skateboarding. It is available in black colour. 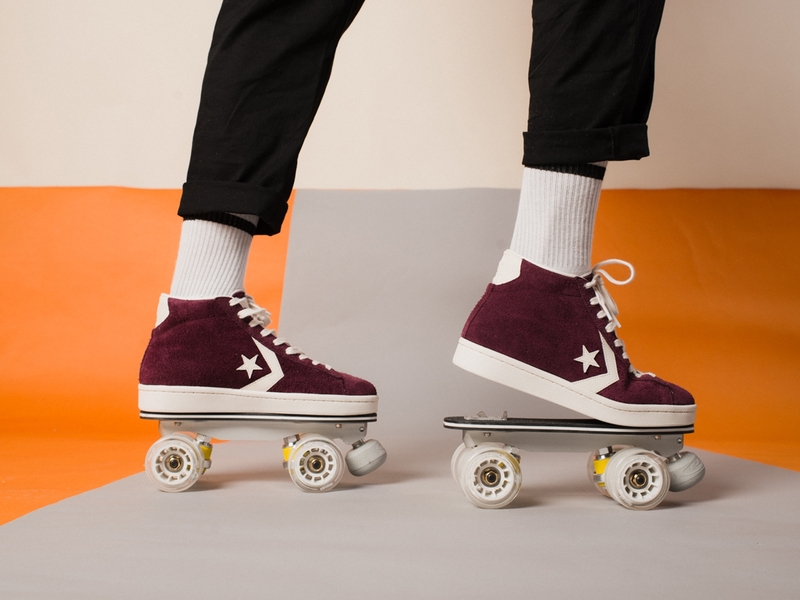 This model, updated to withstand the extreme use of skaters, is the perfect combination of style, modernity and comfort during your skating sessions. Classic 90’s basketball sneaker, the Fila Cage Socks has been modernized to offer comfort and durability. This cult model, released in 1993, made of leather offers a very good ankle support thanks to its high structure. The solid and monochrome rubber sole offers a perfect finishing touch. The special feature of this model: the Blue, white and red striped terry fabric at the back of the shoe bring a new aesthetic, and recalls the socks and the iconic style of the brand. 90’s Iconic model, the T1 Mid Green is a shoe combining style and technique. This sneaker mid-high white leather, perforated at the front, features dark green details on the sides. The Italian flag, discreetly sewn on the shoe tongue, recalls the origin of this legendary tennis. The T1 Mid is a high-performance shoe that is pleasant to walk or roll. The thick rubber sole provides resistance and grip. Like many basketball brands, Reebok draws its savoir faire through its contact with athletes who wear their models. This British brand is as popular in the streets as it is in sports halls. By ensuring the durability of its bestsellers such as the Reebok Freestyle, the brand has become a reference for its shoes designed for practice and adapted for the street. Veja brand offers the seductive idea of no longer having to choose between design and commitment, and offers a Veja V-12 that meets the codes of luxury, all leather. Listed in the “Bastille” collection of the brand, this high-end shoe offers superior quality thanks to the materials used to make it. The model is available in Almond Pierre color. The story of this legendary brand begins in the early twentieth century, when Mills Converse creates his firm of rubber-soled shoes in Massachusetts. In 1917, inspired by Mr Converse’s interest in basketball, the famous Converse All Star became a reference shoe for the practice of this sport with the player Chuck Taylor who made this model his favorite shoe. All major teams wish to have this model, and Converse shoe become the best-selling pair in the United States in 1955. In 1976, Converse released the Dr. J. in leather to strengthen its leading position in the sneaker market. Today, and after years, Converse remains an essential fashion ally for urban youth. Released in 1976, after the All-Star Chuck Taylor model success, the aesthetics of the Converse Pro Leather quickly differentiated it from sneakers trading the basketball courts to that period. We look forward to seeing you amazed and cliping on… See you soon! To be kept informed of our upcoming events in France, or elsewhere, subscribe to the newsletter.